If you did an internet search for “sexual pleasure” and landed on this page, I’m sorry to have to disappoint you. This is not that kind of post. Fast forward to the three days I spent at a retreat center in Wisconsin, off in a little cabin in the woods with nothing to do but read, write, relax, and try not to fall down on the ice and uneven paths. I’ve long used the Insight Timer application on my phone to have access to guided meditations and lectures but because I knew the retreat center had little to no Wifi or phone signal, I decided to pay for the application so I could download meditations to my phone, which also gave me access to their courses. I chose to download a meditation course called Methods for Living with Pain and Illness taught by Vidyamala Burch. After being led through lessons covering letting go of the struggle, using your breath to anchor yourself, and moving from resistance to acceptance, I landed on Lesson 6 – “The Treasure of Pleasure.” It was about learning to recognize pleasant moments amongst the painful and difficult ones. 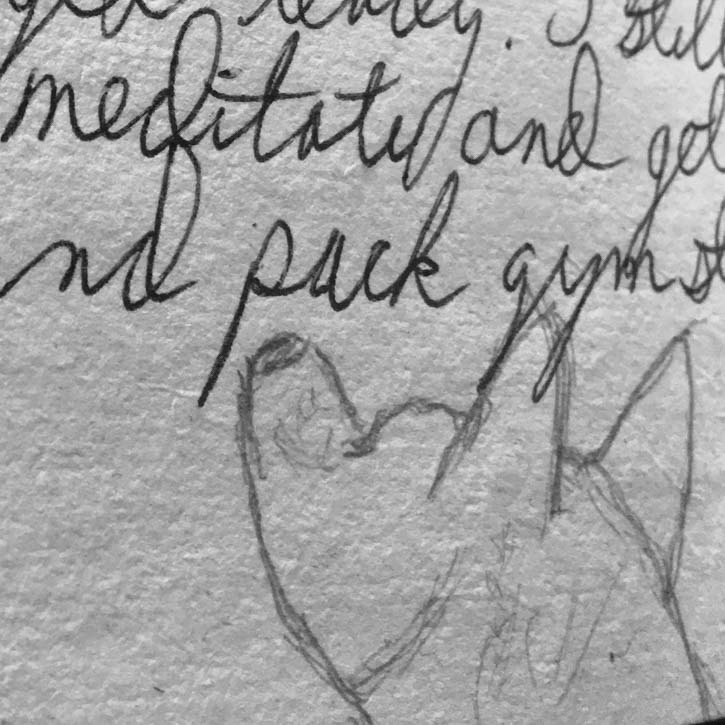 This lesson above all the others stuck with me, and I decided to replace my journal’s gratitude list with a pleasure list. In truth, a list of gratitudes and pleasures could be the same thing. Both can include coffee and chocolate and sleep. But somehow focusing on “pleasure” changes it for me. Pleasure is more experiential. It’s more of an action. I can add pleasure when none exists. Whereas, when I looked for things to be grateful for, they were things that happened outside of me. They were things that dropped from the sky. When I was doing my gratitude list and wrote down that I was grateful for coffee, I was thinking along the lines that thank goodness someone invented this stuff! I’m grateful to the farmer who grew and tended and harvested the coffee beans, the people who helped ship it from the country it came from, and Dogwood Coffee (a local roaster) for roasting and selling it to me. Thinking of the chain of people that make things like coffee and food and warm wool sweaters IS a good thing. But it doesn’t help pull me out of the funk I can fall into. When I think about the pleasure of coffee every morning, I realize it’s not just the coffee. It’s the whole ritual that I find so enjoyable. 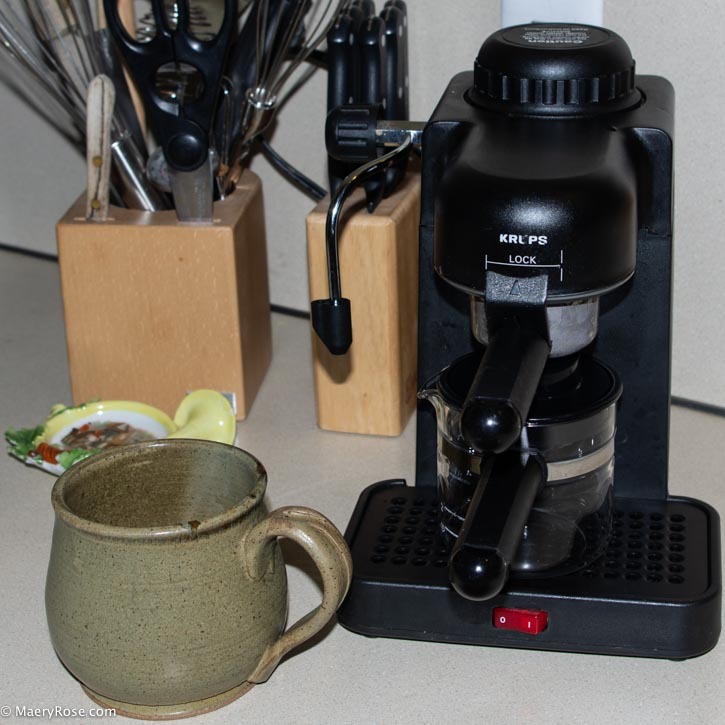 I pull out and prepare my old, one-cup espresso maker to brew the coffee and steam the non-dairy blend of coconut and almond cream. Then I pour the coffee into the cup and take in the earthy smell and top it off with the sweet spice of cinnamon. 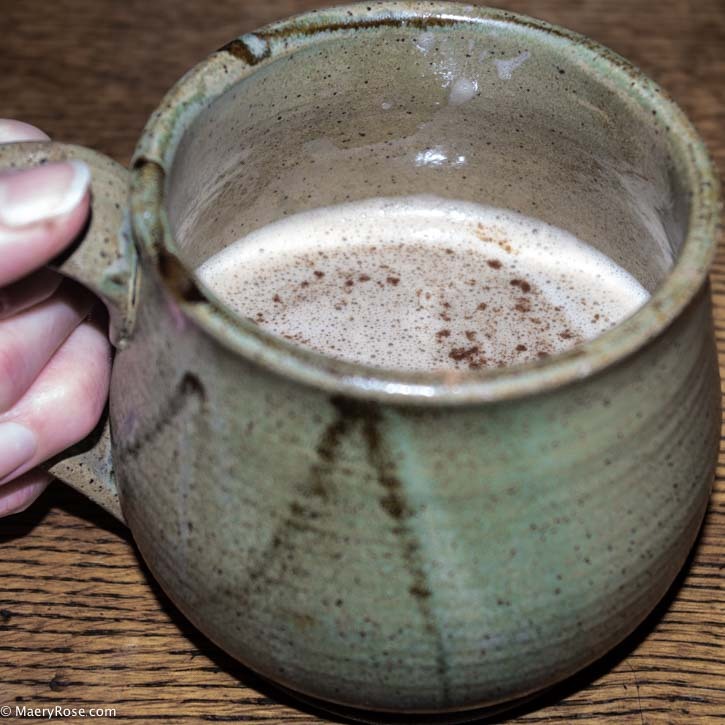 Circling my hand and fingers around the handmade clay mug, I feel the comforting warmth of it. There’s a pause before I take the first big swallow, then the feeling of all that goodness spreading down my throat and into my body. Oh yeah, baby. Now that’s pleasure. And I get to repeat it every morning. That’s gratitude. Keeping an eye, ear, nose, mouth and skin looking out for pleasure throughout the day makes life feel more alive. My senses hone into everything that makes a moment smileable. Having one of the dogs come sit by me while I read becomes a moment to notice the warmth of where their body leans against mine, the softness of their fur, the something in their eyes that feels like such acceptance and love. If I have my pencil and journal nearby, I’ll do a quick and awful sketch of them, which is always good for a laugh. It’s not that I don’t still get cranky and down with aches, sleeplessness and jars that won’t open for me, but at least now, I have a chance of finding or creating something to counteract all that. Below are a couple podcasts that I’ve run across recently that lift my spirits; the first one because it brings a poem every weekday into my ears; the second one because, well, it’s about deviant women. The Slowdown: short five minute podcast every weekday where US Poet Laureate Tracy K. Smith delivers a a poem along with her wise words about the piece. Deviant Women: Discussions of deviant women from history, fiction, mythology and the contemporary world. There won’t be any new podcasts until March 2019 (around International Women’s Day on March 8) but it’s a good time to listen to Season 1 and 2.